The Chow Chow dog breed is known for its distinctive ruff of fur around its neck that resembles a lion’s mane, but one look at its bright, intelligent eyes peering out from its thick fur will capture your heart. This aristocratic dog acts more like an aloof wolf rather than a bounding puppy, which may be a perfect fit for your family. In fact, if you bring a Chow Chow dog into your family, you will join the long ranks of royalty to own this precious breed. The Chow Chow is one of the ancient dog breeds, originating somewhere in China or Arctic Asia approximately two to three thousand years ago. One Chinese ruler was said to have owned thousands of Chow Chows, and they accompanied emperors, soldiers, and peasants alike, serving as war dogs and pulling sleds. Through the years, their popularity has rarely waned. Well-known people such as Sigmund Freud, Martha Stewart, and President Calvin Coolidge have owned Chow Chows. The Chow Chow’s distinctive features extend far beyond its leonine fur. They are usually red, but the fur also comes in fawn, black, blue, or cream varieties. The coat is always a solid color. The Chow Chow stands at twenty inches high and weighs approximately 45-70 pounds. To ensure your Chow Chow remains at a healthy weight, feed it high quality food twice per day and limit treats. In China, the name for this breed is Shongshi Quan, which means “puffy lion dog”. This is apt as the Chow Chow’s coat is remarkably fluffy, complete with fluffy leg feathers and a puffy tail carried curled over their back. Most Chow Chows have a rough coat, which is the typical puffy coat, but smooth-coated Chow Chows do exist. However, both have generally the same grooming requirements. The Chow Chow is fiercely protective of its family and often picks one or two favorites. It is wary upon meeting strangers or new dogs, and it will do best as the only dog in the house. Chow Chows are somewhat stubborn, but with patience they will house train and learn obedience. Once they form a solid bond, training will become easier. Physical violence should never be used with any dog, and for the proud Chow Chow, it will be counterproductive to any training and demolish all its respect in you. Due to their strong hunting instincts and distrust of strangers, they should always be kept leashed or supervised in a fenced yard or run. The Chow Chow will snap if provoked, and therefore only older children who understand how to treat dogs correctly should be allowed around this breed. It is important to socialize your Chow Chow by bringing your dog into new environments and introducing it to new people. Not only will your dog become more comfortable in new situations, you and your dog will form a bond of trust and respect over the years you spend together that is quite unlike the relationship you may form with dogs of other breeds. As the Chow Chow is double-coated, it does shed, but not liberally. 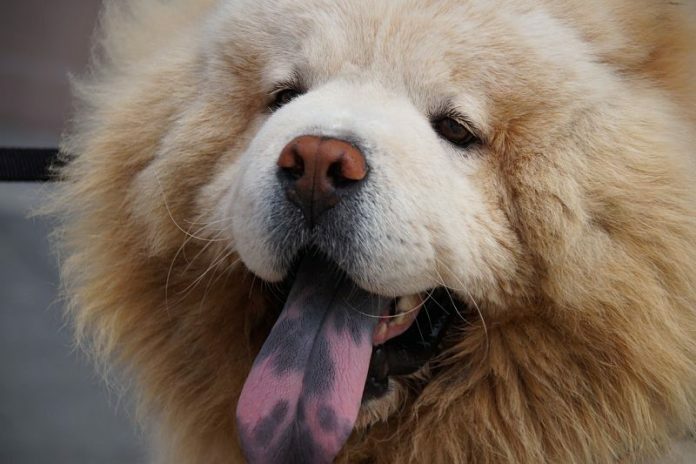 Chow Chows should be brushed about three times a week or more, as needed, as in their seasonal shedding times. Their hair should be brushed with specialized brushes; consult a groomer for the brushes that will be most effective for grooming your dog. Be sure to use a diluted coat conditioner when you brush your dog, as if you try to brush its fur dry, it will break. Your Chow Chow’s grooming should also include brushing its teeth, cleaning its ears, clipping its nails, and monthly bathing. A unique feature of the Chow Chow is its blue-black tongue. Additionally, as the Chow Chow is a low-energy breed, it will be satisfied with a few fifteen minute walks each day paired with one long walk. This will both exercise its body and mind. The average Chow Chow lifespan is nine to fifteen years. They may develop glaucoma, lymphoma, cataracts, hip dysplasia, skin melanoma, and diabetes. Due to the unique set of their eyes, Chow Chows are also prone to developing entropion, which is when the eyelid folds back in on itself. Check your Chow Chow’s eyes once per day, or more, to ensure that this condition is caught and can be rectified quickly with the help of a veterinarian. Additionally, due to their flattened noses, they are incredibly sensitive to heat and cold and should never be forced to stay outside for hours on end without intense supervision, and should never be kept outside to sleep. A Chow Chow dog is a quiet, intelligent personality all to itself, and bringing one into your family and seeing how it interacts with the world is a special, unforgettable experience.